The Quick-lock board attachment system allows you to connect and disconnect the board from the rig below the joint as well as above the joint with the Euro pin. The deck plate that remains on the board and is the thinnest, smallest, least obtrusive board connection in windsurfing. The Quick-lock system is super strong, proven in giant surf, for many, many years with not one failure. 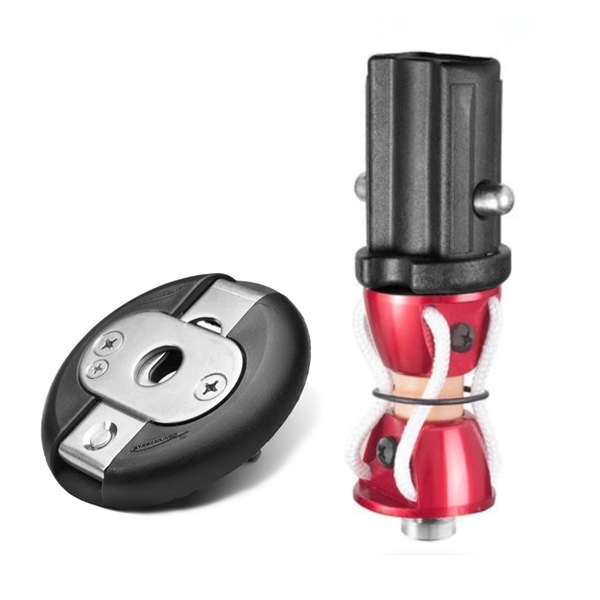 It has low bend point, on center, free rotating above and below the joint and tried and true Quick-lock design lasts forever and will not let you down. It comes with the original, best tendon joint available [including 3 line Dyneema safety, gets you back without damaging your board] and U.S. base cup to connect to base cup extensions. . All these things together in this design, the Quick-lock, the tendon joint, the Euro pin, is the best, two screw board attachment and joint of all. Pro-tested! The tendon is easy to inspect and replace when necessary. As with all Streamlined products, the tendon is warranted for one year. All Streamlined tendon universal systems are built with unbreakable aluminum end caps and a Spectra, 816 kilogram (1800 pound) break strength safety line. This is a connection you can trust! Streamlined has refined the tendon universal joint design it invented in 1981 and it is still the strongest joint available. The unique Streamlined design has evolved and been refined over the years, while every other company plays catch-up copying Streamlined's unique design. Streamlined still uses the same basic original design and the new Uni-Deck Disc was added in 2012. In 2011, the overall size increased and the materials were upgraded and a safety line was added to assure you can sail back, even in the unlikely event of a tendon failure. Since 2008, the end caps are machined from billet 6061 T-6 aluminum, then anodized hot red, and incorporate a true four-line safety line. This design is not only safer, it keeps the niversal closer together and virtually eliminates damage to the deck of your board. The tendon is easy to inspect and replace when necessary. As with all Streamlined products, the tendon is warranted for one year. Streamlined's design, combined with their roven salmon-colored urethane tendon formula, will give you the ultimate confidence in all windsurfing conditions and disciplines.